"I came to Urban Dove because I wanted to have a team, and ended up with a new family that will last me a life time. " 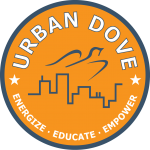 Urban Dove uses the core values of Teamwork, Leadership and Communication to help at-risk youth develop the critical life, job and academic skills they need to graduate high school, succeed in college and build careers. We are building a network of unique high schools to engage students who have fallen off-track and need a new start. Serving over 500 high school students each year, we will grow to serve over 1,500 students in the next five years.